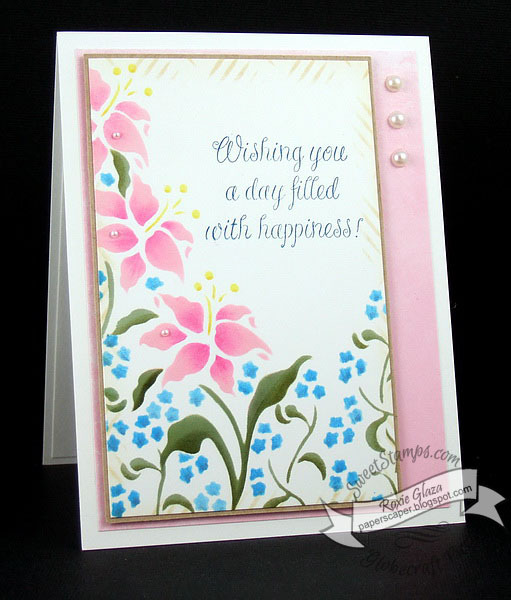 The flowers were created with the Spring Florals stencil from SweetStamps line - Art Stencils, it has four flowers on one stencil and this card uses two of them. I also used the Basket Weaves stencil around the edges. I used a simply method of masking off using mainly the straight edge of paper and painters tape and only had to make a couple cuts to curve my lines and moved the paper around as needed for the next sponging. Lovely, Roxie! The pearls on the side are so pretty and that is one of my favorite sentiments. Awesome design, I love how the stenciled flowers look in your design and how you used just a touch of the basket weave stencil around the edges. Beautiful! !